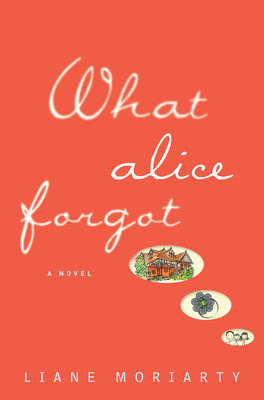 What Alice Forgot was written by Liane Moriarty. I read this book as a part of the BlogHer Book Club. What would you do, if one day, you woke up and realized you completely forgot the last 10 years of your life? Think back 10 years. What would your self from 2002 think of your self in 2012? Are things very much the same? Is ANYTHING the same? 10 years ago I was married for a minute. I was a blissful newlywed. I had just finished my Master's degree in Elementary Ed. I was an assistant director for a hospital child care center. I spent money on clothes and shoes and frivolous things. I was 29 years old and weighed about 50 pounds less. Today we've celebrated our 10th anniversary. We still have blissful newlywed moments... but we also have grumpy married couple moments. I'm a stay-at-home mom to 2 girls and I spend my free time writing online and obsessed with social media. We spend our money on things like siding for the house (oh my God we just spent all our money on siding!). I'm 39 years old and I wish I weighed 50 pounds less. Life has changed in 10 years. That's for sure. I spent every single chapter of this book thinking "what in the world would I do if I were Alice???" I procrastinated on starting this book... but once I picked it up I couldn't put it down. I loved the 3 different perspectives in the book (Alice, her sister Elizabeth, and her grandmother Frannie). I loved how the reader was kept in the dark, sometimes feeling just as confused as Alice... always catching up just as Alice caught up her self. And the ending. Sigh. I hate to ruin an ending in any way... but I will just go with saying the story looked like I was going to love the ending, then I was going to hate the ending, then I loved it again. I was right there figuring out Alice's ending right up until the epilogue. Now.... I think I have to read it again, knowing what happens.